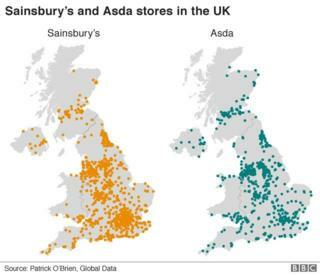 Customers could see higher prices and less choice as a result of the proposed merger between Sainsbury’s and Asda, the UK’s competition watchdog has said. The Competition and Markets Authority (CMA) said it could block the deal or force the sale of a large number of stores or even one of the brand names. However, it also said it was “likely to be difficult” for the chains to “address the concerns”. Sainsbury’s boss told the BBC the findings were “outrageous”. In its provisional report on the proposed merger, the CMA also said the merger could lead to a “poorer shopping experience”. Stuart McIntosh, chair of the CMA’s independent inquiry group, said it had found “very significant competition concerns in a number of areas – they are to do with grocery shopping in supermarkets, grocery shopping online and the companies’ petrol stations”. “However, if one recognises that the competition concerns are quite broadly based… putting together a package of measures which addresses those concerns is likely to be complex and quite challenging,” he said. But Sainsbury’s chief executive Mike Coupe described the CMA’s analysis as “fundamentally flawed” and said the firm would be making “very strong representations” to it about its “inaccuracy and lack of objectivity”. The firms will have a chance to respond to the CMA’s provisional findings, before it publishes its final decision on 30 April. 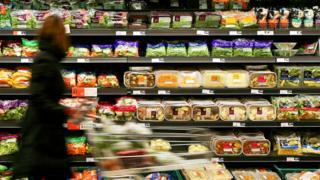 The deal would create the UK’s biggest supermarket chain, a business accounting for £1 in every £3 spent on groceries, with a 31.4% market share and 2,800 stores. The CMA’s Mr McIntosh said: “We have provisionally found that, should the two merge, shoppers could face higher prices, reduced quality and choice, and a poorer overall shopping experience across the UK. This DYF services allows you to grab the opportunity to Setup Ultrasuite theme on your Server and 5 Key Pages Setup too.